The only available teaching model which allows review of the principles and tools necessary to validate the knowledge and skills needed for Peripherally Inserted Central Catheter (PICC)lines. The rapid acceptance and use of PICCs creates a need to ensure that the competency of all staff members is assessed, maintained, demonstrated and continually improved. Peter PICC is a portable, lightweight, teaching model featuring anatomically correct superior vena cava, subclavian, jugular, median basilic, basilic and cephalic veins. The moveable chin simulates occlusion of the jugular vein which can prevent the PICC from taking this path. 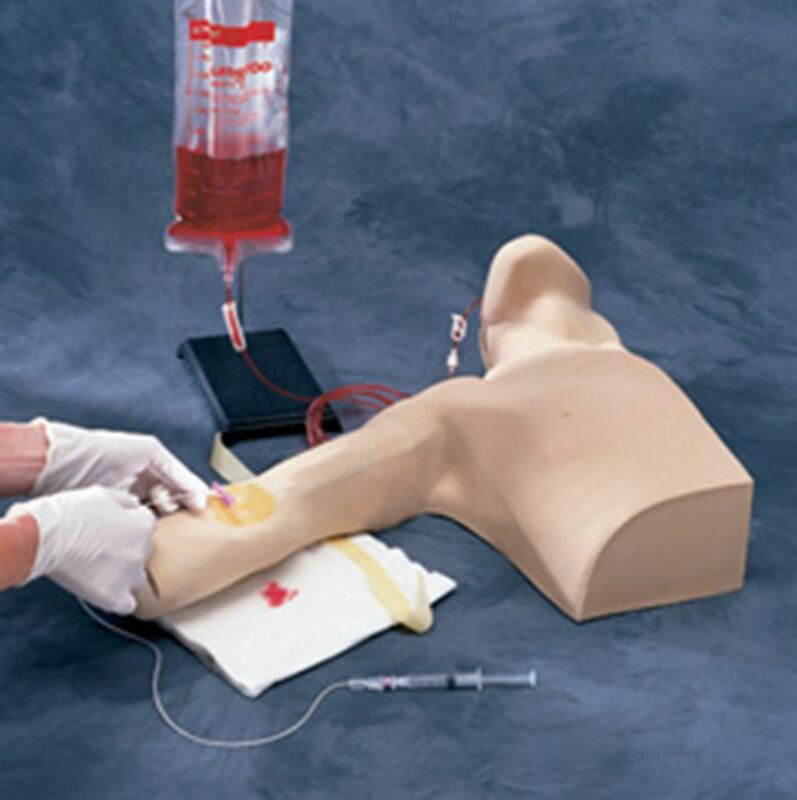 This model enables staff to practice sterile technique in the set-up and insertion of the PICC line. Palpable ribs permit the practice of measuring proper catheter length from the insertion site to the second or third intercostal space and the confirmation of proper placement of the distal tip of the catheter in the viewable superior vena cava. Standard IV catheter placement is also possible in the major veins, which are barely visible through the translucent arm skin. Gain confidence, master the techniques of PICC insertion and then transfer these skills to patients. 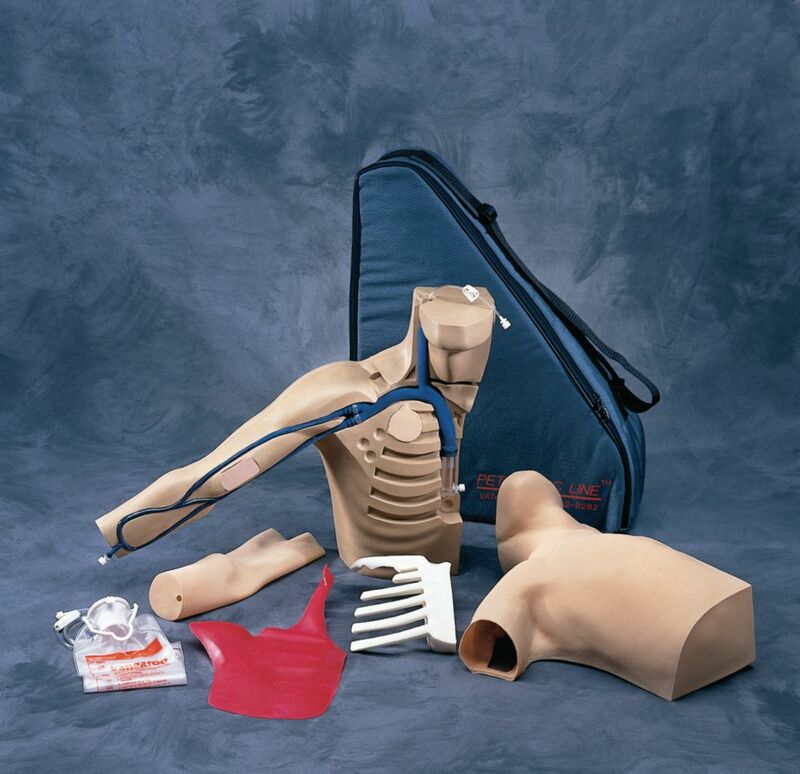 Peter PICC is an upper torso model including, neck, chin, right arm, ribs, muscle tissue, arm skin, body skin, arm vein set, body vein set with viewable superior vena cava, fluid bag with tubing and a durable, soft-sided cloth carrying case with an additional pouch for supplies.